One of the most troubling statistical realities in the United States is the rise of prescription opioid abuse and the death toll which follows in its wake. Prescriptions and sales of opioid pain relievers have quadrupled in fewer than twenty years, and the numbers for prescription opioid overdose deaths have increased hand-in-hand with availability. You don’t need lab furniture and a Ph.D. to look at those numbers and see a troubling causal correlation. Opioid pain relievers are dangerous for myriad reasons, even when prescribed by a medical professional. First of all, by their very nature, opioids are habit forming; if you take them during a prolonged period of recovery, like following a surgery or a serious auto accident, there’s a good chance you’ll need to take more in order to get the same effects. This will inevitably lead to dependence and addiction, especially if you don’t understand how these drugs impact the human brain. The majority of people who recreationally abuse opioid painkillers get them for free from friends or relatives who had prescriptions in the past and stopped taking the drugs when they felt better. However, according to the Centers for Disease Control, those who abuse opioids non-medically for two hundred or more days every year tend to be adept at obtaining prescriptions, with twenty seven percent reportedly getting their drugs from more than one physician.1 These individuals are most at risk of overdose and death, and also have a much higher probability of using heroin for the first time in order to satiate their addiction, as heroin is much easier to obtain at the street level and pure heroin is typically much stronger than prescription pills. With such volatile, deadly drugs as a first and often only option for patients seeking pain mitigation, it’s no wonder overdose rates are on the rise. Many doctors prescribe opioids because there simply aren’t any better options out there for patients experiencing moderate to severe pain on a daily basis. But studies are showing that there may be a great alternative to traditional opioids, and one without the associated risks of addiction, abuse, and overdose: good old-fashioned medical marijuana. There’s a massive stigma associated with marijuana use in our culture. Forgetful stoner hippie characters abound in our movies and television shows, perpetuating the ‘hapless stoner’ stereotype. People who use marijuana recreationally are portrayed as dullards and morons at best and dangerous criminals at worst. Many of us grew up hearing marijuana described as a ‘gateway drug’ in elementary school DARE programs, which have since been proven ineffective at dissuading kids from trying drugs. The fact of the matter is that marijuana has no place on a list with drugs like heroin, methaqualone, MDMA, or GHB, and yet it is qualified as Schedule I under federal law in the United States. According to the Drug Enforcement Agency, Schedule I drugs have “…no currently accepted medical treatment use in the U.S.” This has created tension between states and federal agencies, as twenty eight state governments as well as Washington DC itself have legalized marijuana for medical use. While the federal government remains staunch in its insistence that marijuana is dangerous and serves no practical medical purpose, more and more people from all walks of life are becoming vocal advocates for its use to combat pain and other conditions. Furthermore, sufferers of debilitating ailments like epilepsy, cerebral palsy, and Tourette’s syndrome have found marijuana to be helpful in managing day-to-day symptoms such as tremors, seizures, and tics, allowing them to lead more normal and enjoyable lives. Even as drug overdose deaths reach epidemic levels in the United States, it is becoming evident that states where medical marijuana is a legal alternative to traditional painkillers to manage recovery are suffering lower levels of prescription opioid addiction and overdose deaths. In fact, one joint study conducted by researchers at the Johns Hopkins Bloomberg School of Public Health and the Philadelphia Veterans Affairs Medical Center shows that states that have legalized medical marijuana are trending opposite to the rest of the country when it comes to opioid overdose deaths. The study, based on county-level death certificate statistics, shows up to twenty five percent fewer overdose deaths than states without medical marijuana laws on the books. Scientists are hard at work at their lab benches across the nation attempting to conduct studies on the risks and benefits of medical marijuana. Research on Schedule I substances is typically difficult to fund, involving copious amounts of red tape and permissions for any lab planning to conduct control studies. As states legalize medical and recreational use thanks to cultural changes and voter awareness, scientists are scrambling to collect data and perform long-term studies on marijuana and THC as medicine. This is important, since anecdotal evidence continues to point to the fact that medical marijuana is a viable substitute for some cases of opioid prescription. While smoking the flowers of the marijuana plant is definitely the most common method for ingesting THC and harnessing its medical benefits, there are multitudes of other ways in which patients with chronic pain can find relief with marijuana. Smoke inhalation is never a wholly positive experience for the human body, even if said smoke is less harmful than tobacco and chemically non-habit-forming. Chemically purified and concentrated cannabis products, which can be smoked and inhaled in much smaller amounts to greater painkilling effect, are already widely available in states like California and Washington which have traditionally been ahead of the curve when it comes to marijuana laws. The problem with these concentrates is that they are somewhat labor intensive to produce, and without chemical hoods and other requisite lab furniture they can be hazardous to manufacture. In addition, marijuana-infused food products have been lauded for their ability to provide all day symptom mitigation with relatively low dosages while bypassing any physical dangers associated with smoking. It’s relatively easy to infuse cooking oil or butter with cannabis, which can then be added to any food to make it medicinal. In states with well-established medical marijuana industries, cannabis-infused food products can usually be purchased at dispensaries with carefully measured dosage amounts, removing the guesswork from dosing and allowing patients to regulate their pain relief safely. 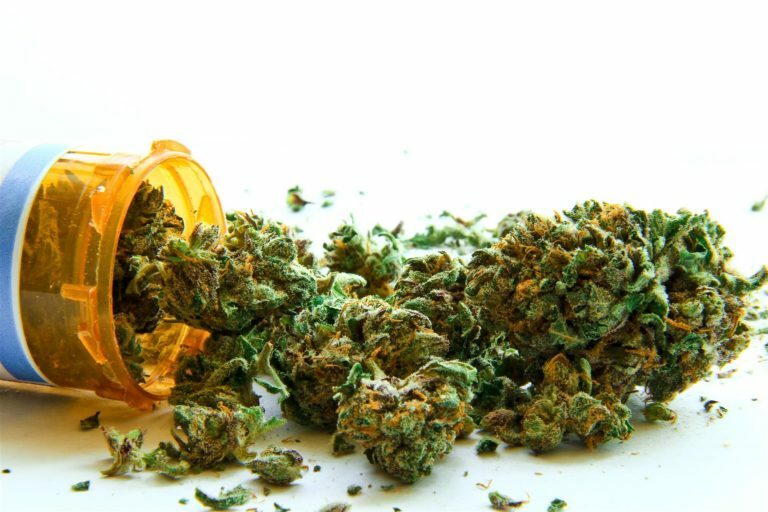 As it stands, patients seeking medical marijuana for pain relief or symptom mitigation typically need to visit a doctor specializing in marijuana prescriptions. This can be a turn-off to many, as it needlessly supports false stereotypes and undercuts the reality of marijuana as a medically viable substance. If mainstream medical doctors nationwide were able to prescribe marijuana for pain relief instead of potentially deadly and addictive opioids, there’s a good chance that the epidemic rate of overdose in our country would be curbed instead of continuing to post record death numbers every year. At the end of the day, peer reviewed scientific studies are the best way to combat misinformation and negative public preconceptions about medical marijuana. As more and more studies crop up painting marijuana as a relatively benign substance, cultural acceptance and normalization will continue to work toward destigmatizing medical marijuana use. It’s all about options – when scientists are able to stock their laboratory cabinets with the right tools to conduct their experiments, without being held back by federal laws attempting to tie their hands. The bottom line is that painkillers are being prescribed too often, to too many people, and for too long. One of the main arguments against cannabis as medicine is that legalization creates undesirable exposure to children, but surveys have shown that a majority of minors and teens who abuse painkillers use their parent or guardian’s medicine cabinet as the source of their drugs. If mainstream medical professionals were given more leeway to seriously discuss marijuana as an option, we would almost certainly see continuing downward trends of opioid overdoses simply due to the fact that there would be fewer prescriptions in circulation.